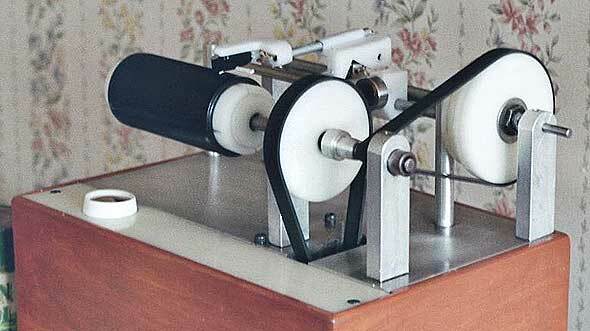 The above machine plays both 2-minute and 4-minute cylinders. The feedscrew speed can be changed by moving its drive belt to a set of adjacent pulleys. 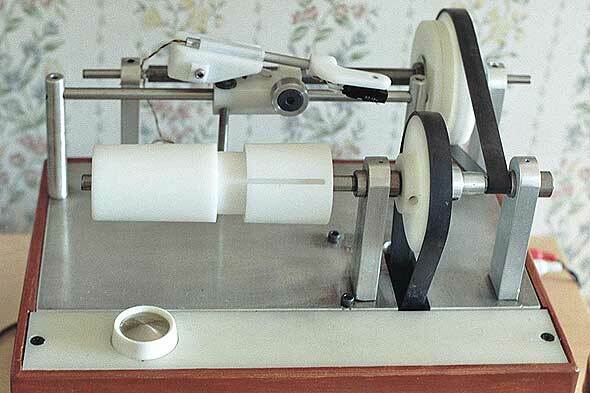 With the use of different sleeves the tone arm can be raised upon its mount to accommodate Pathé intermediate and 5 inch cylinders. Different diameter mandrels can also be easily attached to the drive spigot. The lead screw has 6½ inches of usable tavel so it will also accommodate the longer Columbia cylinders. 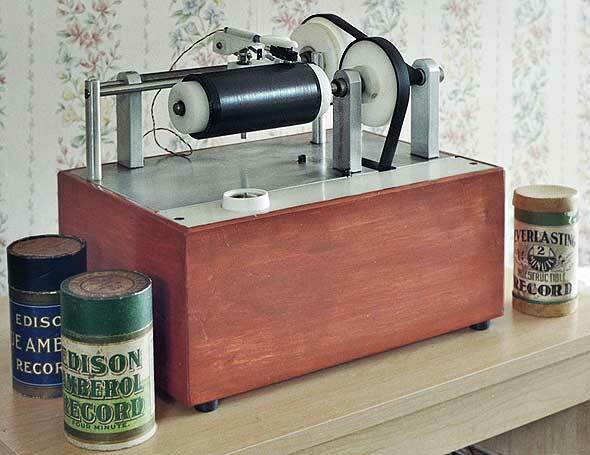 I used nylon for the pulleys, the mandrel, the tone arm, cartridge holder, and carriage. The rest of the machine is made of aluminium. With the exception of the feedscrew, the carriage axle and the axle upon which the mandrel is mounted, these are steel. The axle runs in plain oilite bushes pressed into reamed holes in the two vertical aluminium uprights. The belts are vacuum cleaner belts. The box is wood. The motor is a 3 watt (I think) AC fan motor picked up for $30 Cdn at my local electrical store. There is a bit of a whirrr from the machine but it is completely drowned out by the recorded sound. The knob at the front controls the speed of the AC motor. Its original purpose was a wall mounted switch designed for a domestic fan. Speed selection is done by ear, though a strobe light is a possible future addition. Listen to the 23rd Regiment March, Indestructible 684 (1908) as transferred with Royston Maybery's player!